Men too need skin care, don`t they? Nowadays the metrosexual is the Man, so what`s wrong with a reliable face or eye cream? Take for example Skin Minerals for Men Eye Master from Giorgio Armani which is formulated with volcanic minerals to boost energy to the delicate eye area It also helps reduce puffiness and dark circles, while stimulating the cutaneous micro-circulation. For a perfectly smooth, radiant complexion. Homme Anti-Fatigue Revitalizing Moisture Gel Cream by Lierac is a fast absorbing and refreshing cream which contains ingredients derived from caffeine and ginseng specially formulated to fight the first signs of stress and tiredness while thoroughly moisturizing. It restores a healthy glow to the skin. Razor Burn Rescue from Murad is a must for your man, especially when he complains about irritated skin after shaving. Infused with moisture-rich antioxidants, it reduces redness while dead skin and unclogging hair follicles. For a blemish-free, healthy looking skin. Murad offers another great face product for men, Face Defense SPF 15, a fast absorbing moisturizer offering antioxidant protection and also an effective sunscreen. It contains a Patented Skin Repair System for elasticity and radiance. Your man`s skin becomes gradually clearer and more supple. I bet he`d love it as a present. 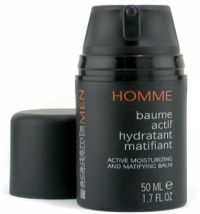 Academie has its own range of products dedicated exclusively to men. One such product is Men Active Moist & Matifying Balm which is formulated with oak and birch natural extracts to tone, moisturize and calm the skin, while reducing signs of premature aging. It absorbs the excess of sebum, it soothes and softens the complexion. The second Academie product I have in mind is called Men Eye Contour Gel. It eliminates the appearance of fine lines and wrinkles, while yeast extracts together with an acid complex enhance the blood capillary network. It helps reduce puffiness and dark circles. For a velvety smooth eye area. Ahava has something interesting in store for your man, Men Protective Moisturizing Fluid SPF 15. Formulated with mineral rich ingredients all the way from the Dead Sea together with ginkgo and ginseng extracts, it detoxifies, nourishes and revitalizes, reducing the signs of aging. For a smooth and refreshed complexion. Compare and research men creams.